January 28, 2019 By Allyson 13 Comments This post may contain affiliate links. Read my disclosure policy. 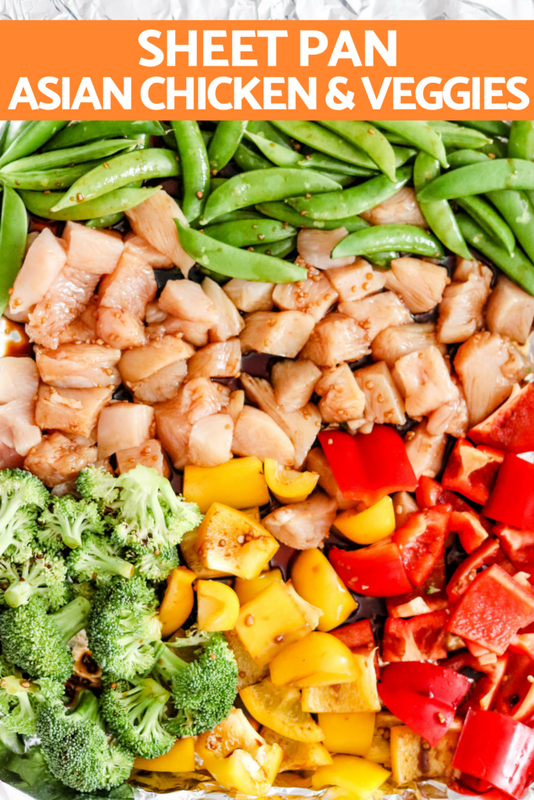 Sheet Pan Asian Chicken and Vegetables only uses one pan and makes a delicious and healthy meal. Great for meal prep and healthy eating! Making sheet pan meals is such an easy and quick way to have dinner on the table. There are so many options for meals when you make these, and this Sheet Pan Asian Chicken and vegetables is so delicious and healthy! Use whatever vegetables you want with this one, but I like peppers, broccoli, and sugar snap pease, and then serve it however you want as well. I love serving the meal over rice or cauliflower rice, and making extra sauce to drizzle over the top- YUM! I also love these Sheet Pan Chicken Fajitas as an easy meal! Be sure to checkout all of my ONE POT MEALS, MEAL PLANNING IDEAS, HEALTHY RECIPES! as well. Like I said, making Sheet Pan Asian Chicken is SO easy! Get all the ingredients together. Pre-heat the oven to 350 degrees. Chop chicken into bite sized cubes, and vegetables into bite sized pieces and arrange onto a large baking sheet (like this one). Make the sauce in a small bowl then drizzle over the top and toss to coat. Place in the oven and cook for 10 minutes, gently toss the vegetables and chicken and place back in oven for 10 more minutes. Carefully remove and serve as desired. Eat as is! Chicken and vegetables make for a delicious meal! Make some white or brown rice and serve over rice! Pack for lunches! 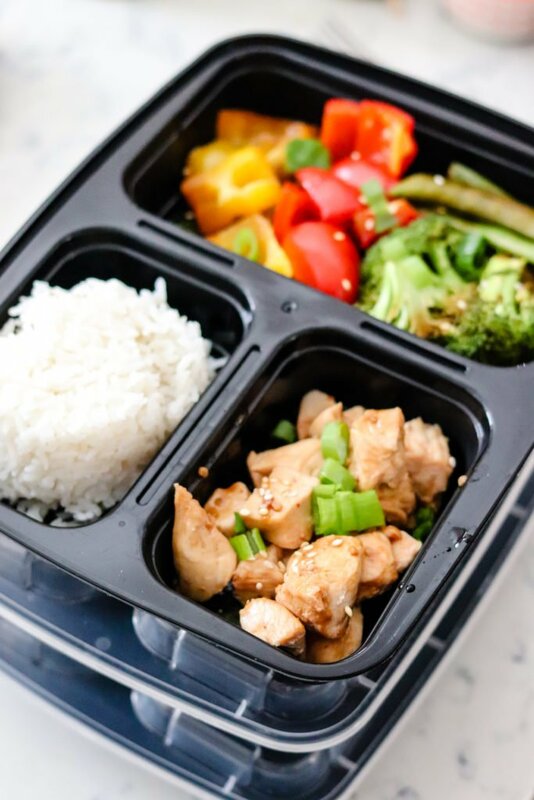 Use 3 section containers and pack vegetables, chicken, and rice to heat up for lunch at work! Serve over cauliflower rice for a lower carb option. Serve with this delicious Quinoa Fried rice on the side- makes the PERFECT side dish for this Sheet Pan Asian Chicken and vegetables! 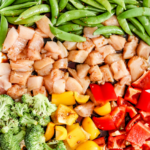 Is Asian Chicken and Vegetables Healthy? Yes, absolutely! Not only is it low calorie, but it fits into the Paleo and Whole30 diets. This recipe makes four servings and each servings contains 221 calories, 3 grams of fat, 22 grams carbohydrates, 5 grams of fiber, and 27 grams of protein. Not only that, but it packs in more than a whole day’s worth of vitamin C, 67% of your daily vitamin A, and 17% of your iron! According to weight watchers, this recipe has 6 smart points per serving! 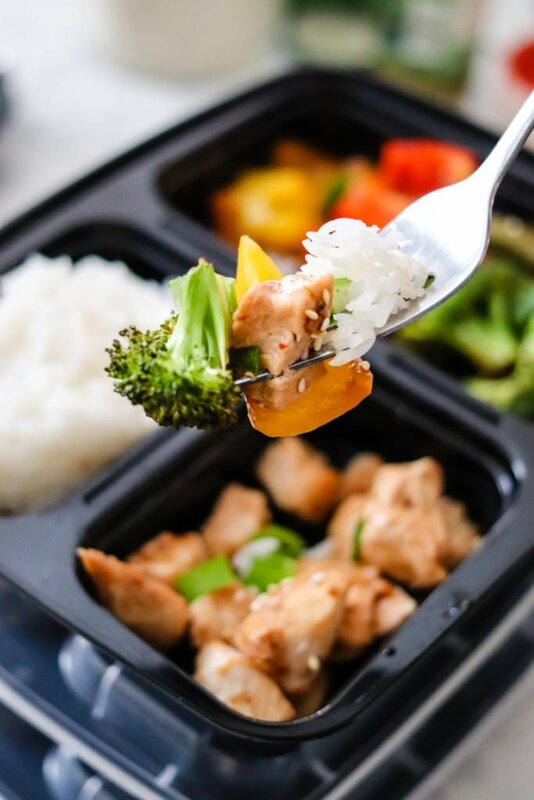 Don’t forget to factor in whatever you serve the sheet pan asian chicken and vegetables with, because that will also add to the nutritional information. 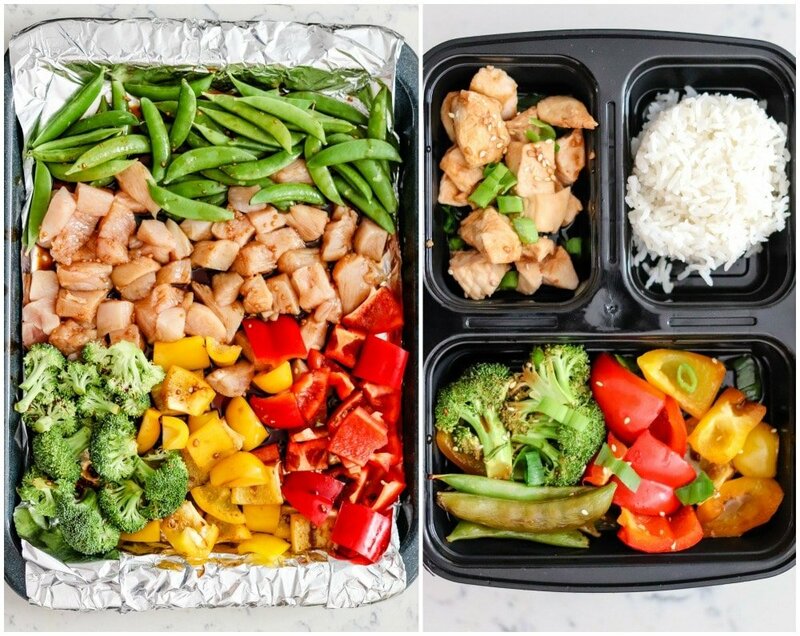 Can I double or triple the Sheet Pan Asian Chicken recipe for meal prep? YES! You might have to use a few baking sheets or an extra large baking sheet (like this one) because you shouldn’t overcrowd the baking sheets or the food won’t cook properly. You can place them into the oven at the same time though! Asian Chicken Lettuce Wraps (one pot) are super easy to make and taste better than the popular PF Chang’s version. This healthy recipe packs all the flavor! Sheet Pan Chicken Fajitas are the perfect easy, healthy meal. Less than 30 minutes from start to finish, these are perfect for meal prep or on a busy night! 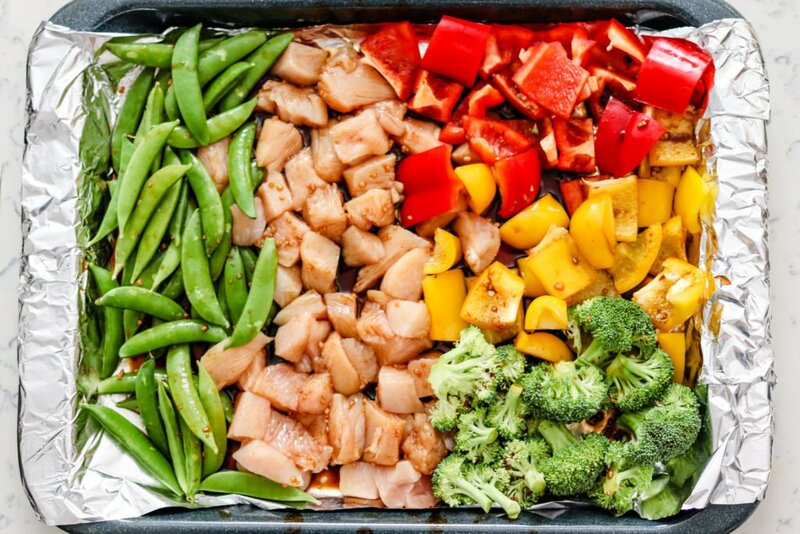 Sheet Pan Asian Chicken and Vegetables only uses one pan and makes a delicious and healthy meal. Great for meal prep and healthy eating! Only 221 calories! In a small bowl add brown sugar, soy sauce, garlic, sriracha, and ginger; mix to combine. Set aside. Using a large baking sheet, cover with foil or parchment (if desired). Arrange chicken and vegetables on baking sheet. Drizzle sauce over the chicken and vegetables and then toss to coat. Place in oven and cook for 10 minutes. Remove and toss vegetables and chicken. Place back in oven for 10 more minutes. Remove. Garnish with green onions and serve as desired. 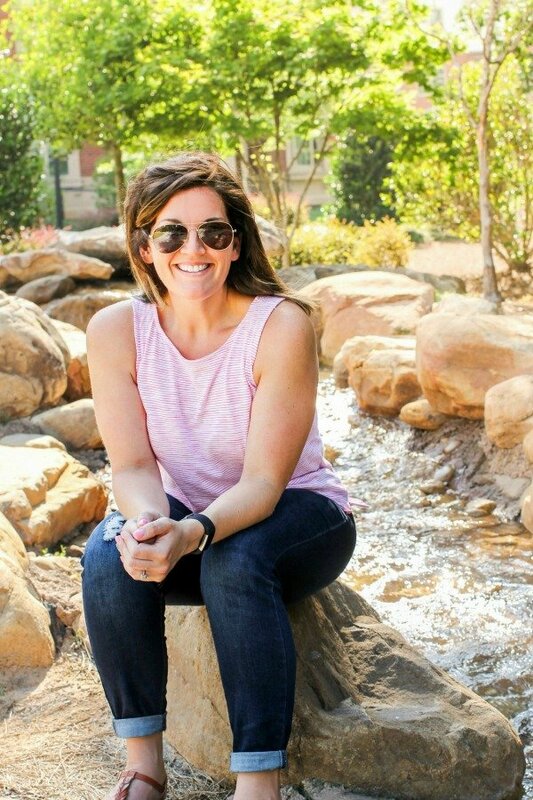 Weight watchers: 6 smart points. This is perfect! I needed more sheet pan meals in my menu plan. So flavorful! I love easy, one pan meals like this! I am saving this to make next week! Sheet pan dinners rock! Adding this to my meal prep plan! This is such an easy weeknight meal option! So flavorful and quick to get on the table. Did I miss a substition list somewhere? Brown sugar and soy sauce aren’t Whole30. Maybe coconut aminos and just omit the sugar? It looks delicious so Im definitely going to test it out this week! Thank You! Looks yummy and easy and can work for my upcoming non-snow snow day. What a great way to make Asian chicken and super idea for the kid’s lunch! Love how healthy and easy this is! Perfect weeknight dinner! Sheet pan meals are the best! I have to make this! What a great dish, especially as a sheet-pan meal! I’m going to try this for my weekly lunches!